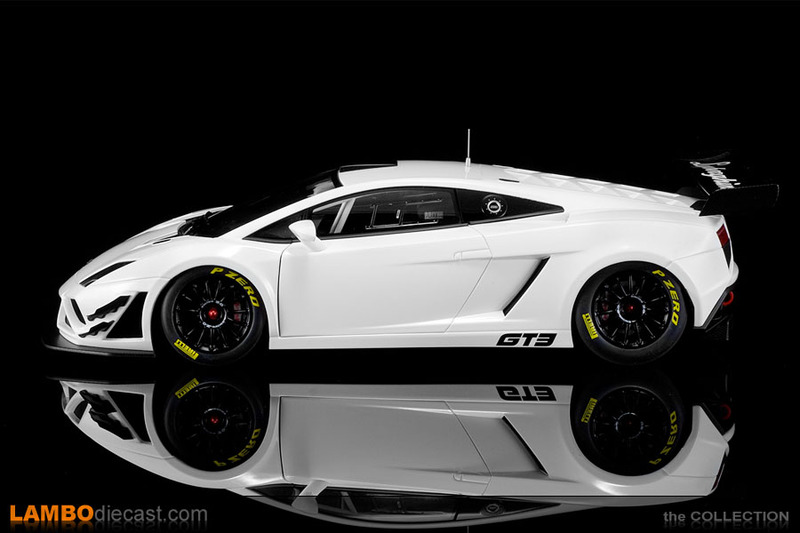 When AutoArt announced they would be building the Lamborghini Gallardo GT3 FL2 in 1/18 scale I was impressed, usually race cars might not sell in the numbers we see in road cars, and the fact the Gallardo has been replaced by the Huracan in 2014 might make it even more difficult to sell a race car based on a model that is no longer being sold. 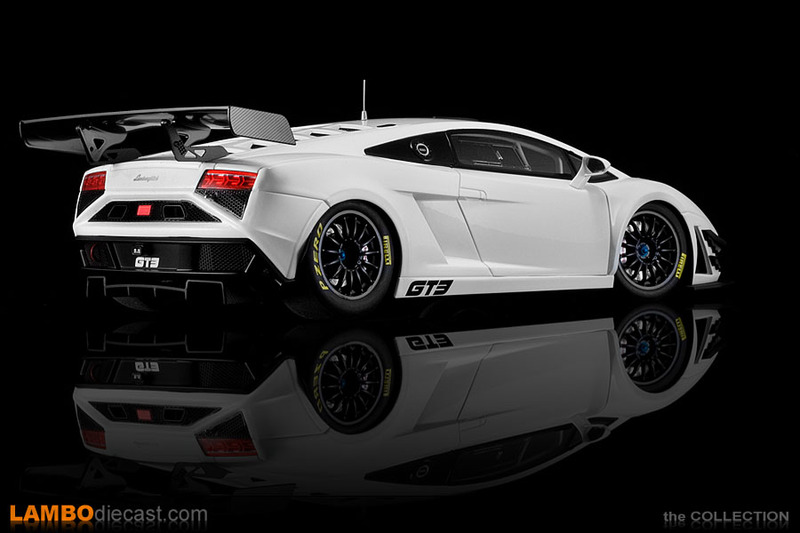 Also keep in mind the Gallardo GT3 FL2 is not built by the Squadra Corse department at Lamborghini but by renowned Reiter Engineering GmbH in Germany ... Reiter has been building Gallardos for the track since 2006 in fact, first with the Gallardo GTR-3 and from 2011 onward the updated Gallardo LP600+ GT3 ... but when Automobili Lamborghini unveiled the next evolution at the 2012 Paris Motor Show it was only obvious Reiter Engineering would use the updated model for their next V10 GT3 racer ... now called the Gallardo GT3 FL2 model. 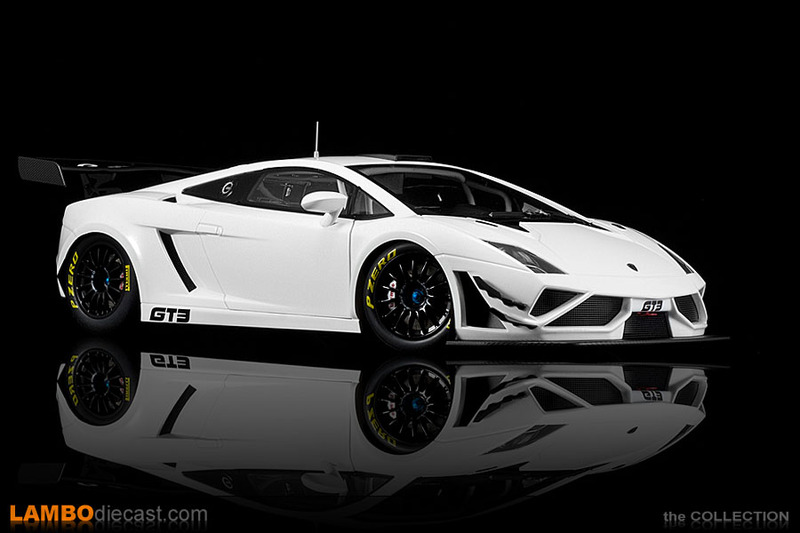 AutoArt first showed their hand made prototype in a nice shade of blue, but as I owned the Gallardo GTR-3 and the LP600+ GT3 in a plain white livery I just had to get this new Gallardo GT3 FL2 in white too ... which in the end was a mistake ... money wise. 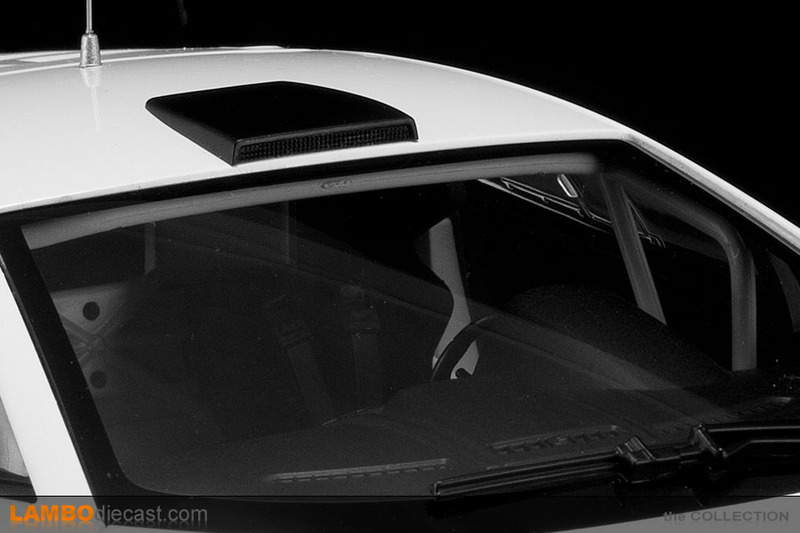 The first shade AutoArt released was a matte grey painted one, which could be found for a rather reasonable price, later orange joined the party and by the time this white model was available in Europe prices had risen to €145 a piece ... note this model only offers opening doors by the way, the front hood and engine cover are sealed! 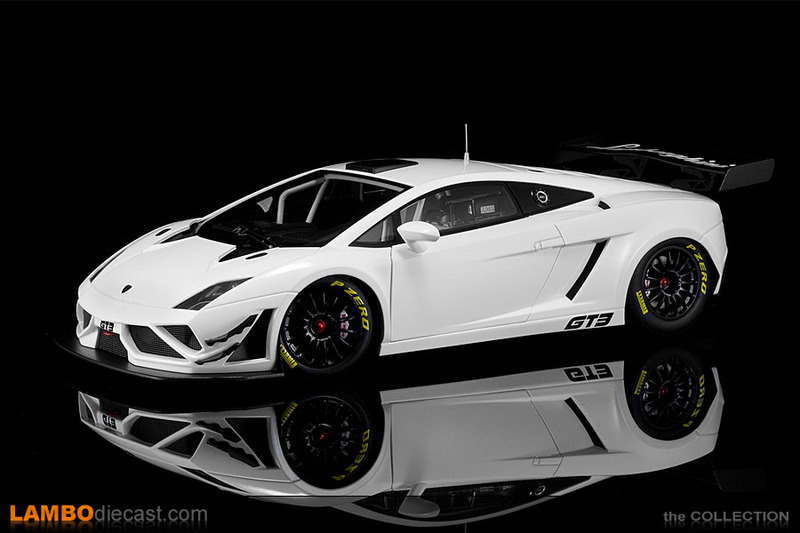 So that is the bad news ... as you will be able to read later one this model is really very nicely finished, but I still think when compared to earlier AutoArt 1/18 Gallardo models this GT3 FL2 is too expensive ... sorry AutoArt. 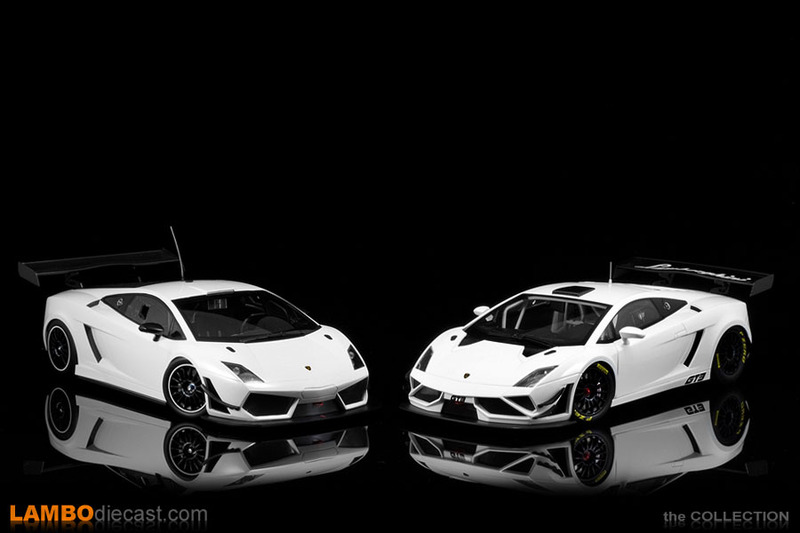 The white paint on this AutoArt is a solid white, not a metallic paint, which is in line with the actual car Reiter Engineering has presented a few years ago, no need for metallic paint on a plain livery car that will probably receive a wrap showing the sponsors in the end anyway ... nota that all the Huracan Super Trofeo race cars also came in plain white originally ... so AutoArt did a good job here ... and the paint finish is as close to perfection as possible ... my model has no defects I could see, so I'm happy with that. 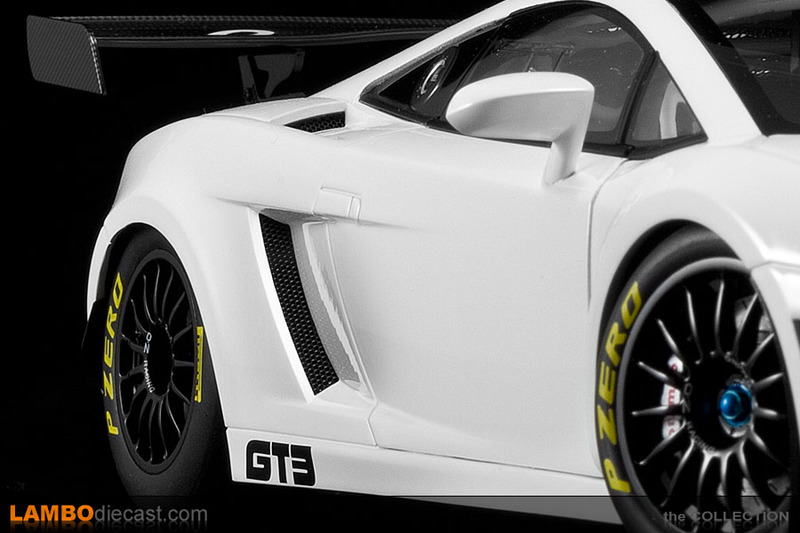 Just one small detail, it seems like the matte grey and this white livery come with a 'GT3' decal on the side sill, just ahead of the rear wheel ... which is nice, but it isn't correct ... it should read 'Reiter GT3 FL2' as this is the FL2 evolution, a very small detail, but wrong nonetheless. Other than that I couldn't find any problems on the outside of this scale car, the grilles are very nice, they look correct, the red 'tow rings' are correct too and are mounted on the same position Reiter installed them on the real car, the brake calipers nicely show the 'Brembo' logo ... as they should, and even the disk brakes are the race specs 'grooved' ones ... very nicely done AutoArt. 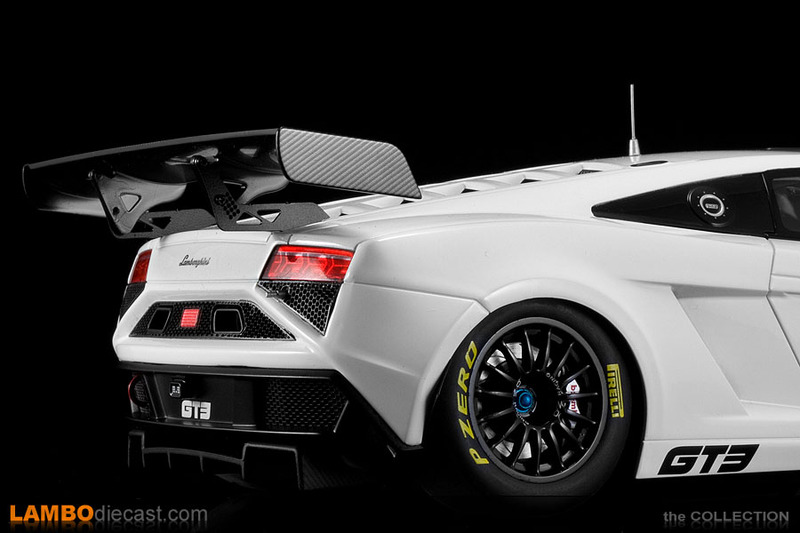 I was also very impressed with that massive rear wing, finished in clear carbon fiber and proudly showing the Lamborghini script ... but what really impressed me was the fact AutoArt went to the trouble of having all those tiny holes made on the struts ... which in real life allow this big wing to be positioned just right to create enough down force on the specific track the car is racing on ... a stunning detail AutoArt got just right. While being at the rear you'll also notice the two special exhaust pipes in the upper grille of the rear bumper, that is the custom Reiter Engineering race exhaust system, but I do want to draw your attention to the grille underneath the passenger side taillight ... note that small hole with the pin sticking out ... that is where the compressed air is connected during a pit stop to raise the car so they can change the wheels ... a small detail perhaps, but perfectly executed by AutoArt once again on this model. 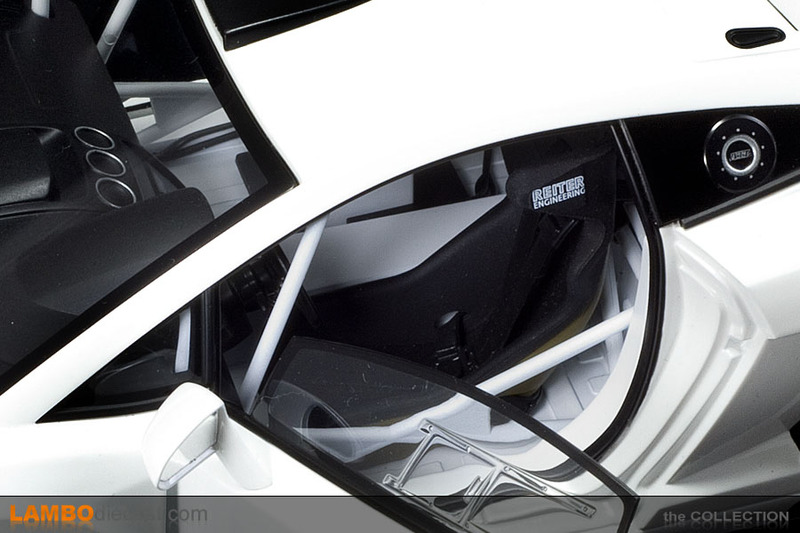 The quick fuel fillers on both sides look great, the side windows have embossed 'sliding windows' which is nice, a real sliding section would be next to impossible ... it might have been a nice idea to have the driver side actually in the 'open' position, but that's just me. 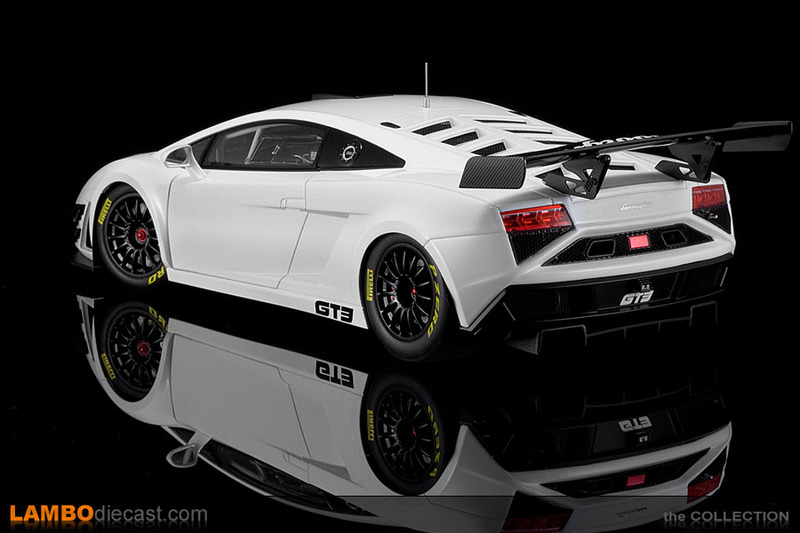 The wheels on this scale model are correct, Reiter is using OZ Racing wheels on thse Gallardo GT3 FL2 cars, and that red central lock is correct too ... strange thing on this AutoArt model is the fact the left side shows red center locks while the right side has blue central locks ... didn't notice that at first, but it seems the matte grey and the orange one also have two different shades left and right, I don't think this is an error, it just seems odd to me, on the press photos from Reiter Engineering their GT3 FL2 had red locks all around. 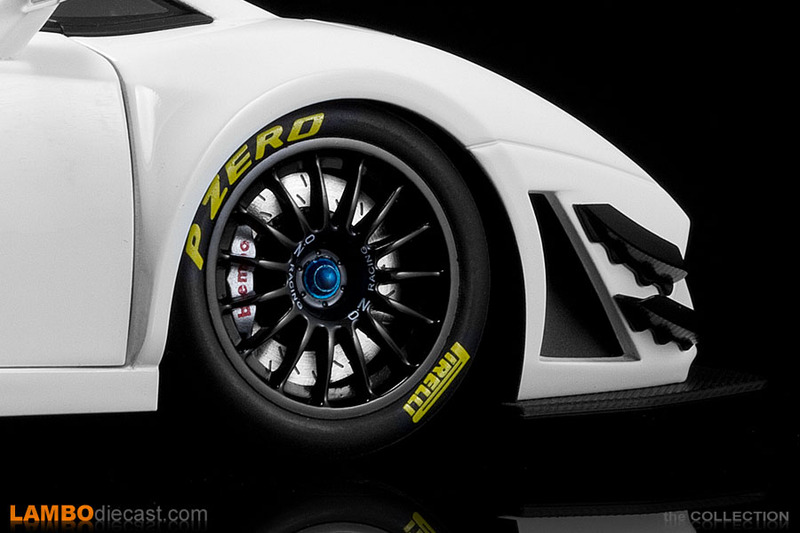 One thing I actually prefer on the AutoArt model and that isn't really correct to the real car is the lettering on the tires ... this models shows a large PZERO and Pirelli logo on the sidewalls, and I love it this large, but the real car has them a lot smaller in fact ... so while not really correct I do prefer it this way. You might think the rear wheels are too far up into the wheel well, but that is in fact correct to the real car, the suspension is totally adjustable and when racing on a smooth track Reiter will in fact run her this low to the ground ... each little bump will have sparks emerging from underneath the car ... very impressive. 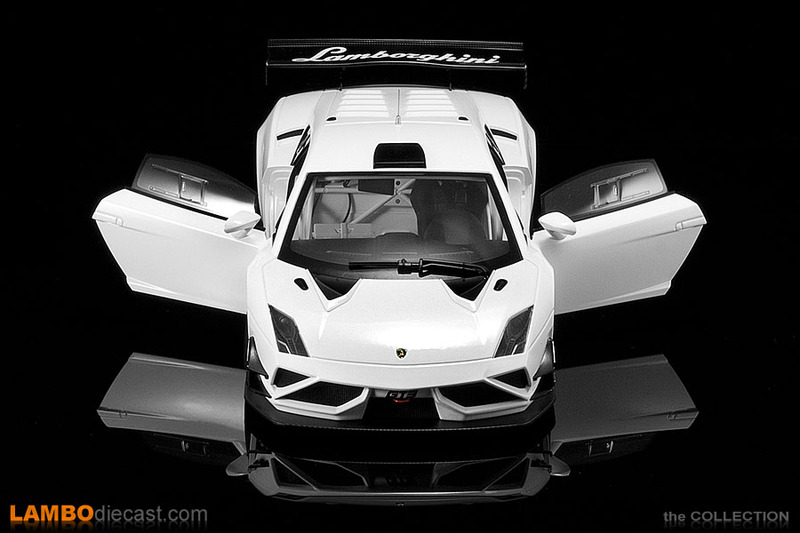 The double 'canards' on the side of the front bumper look just like the real thing too, and that large air vent on the side is just the icing on the cake here, naturally those two triangular vents in front of the windshield are part of the FL2 evolution, so AutoArt put them in place ... inspired by the Sesto Elemento I guess. 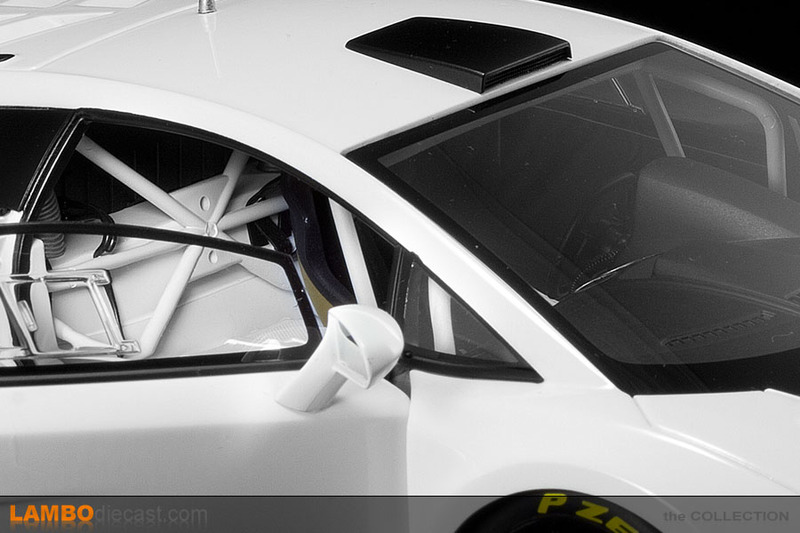 So let's open the doors and take a look inside ... the first thing you'll notice is the amount of detail inside this race car ... it is all there, the digital dashboard cluster, the detachable steering wheel with the spiral connection, the new central console with custom switches, the fire extinguisher in the corner, the full roll over cage ... it is all there ... even the display in place of the rear view mirror inside ... an actual mirror would be useless with the new engine cover, so a camera has been mounted ... and AutoArt picked up on that detail. 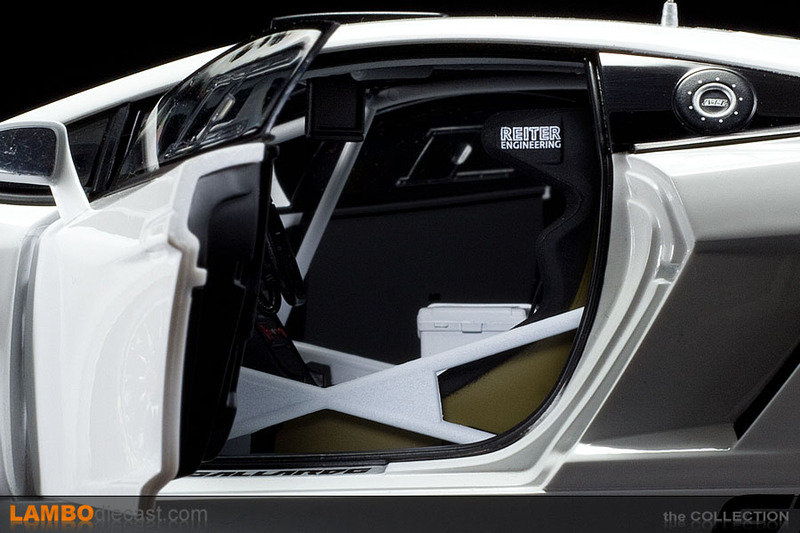 The driver seat is an original Reiter Engineering unit and the multi-point seats belts have been downscaled nicely too ... there is a large white box next to the driver in the spot of a passenger seat ... so AutoArt really made an effort to have lots of details on the interior of what is a rather Spartan race car in the end. 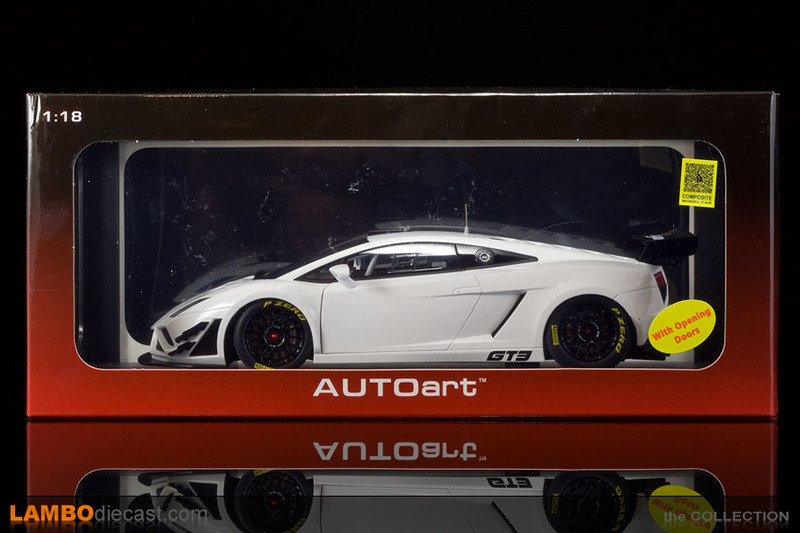 Naturally I have put this new AutoArt model next to the Minichamps edition of the Gallardo LP600+ GT3 .. .both in white, both with sealed hood and cover (on the Minichamps the doors don't open either) ... so who did the best job? Because of the highly detailed interior and the fact you can actually admire it on the AutoArt as the doors open I would have to say that Minichamps didn't do as good as the AutoArt model ... but keeping in mind the Minichamps is sold at about half the price of this AutoArt I would still advice getting the Minichamps too. 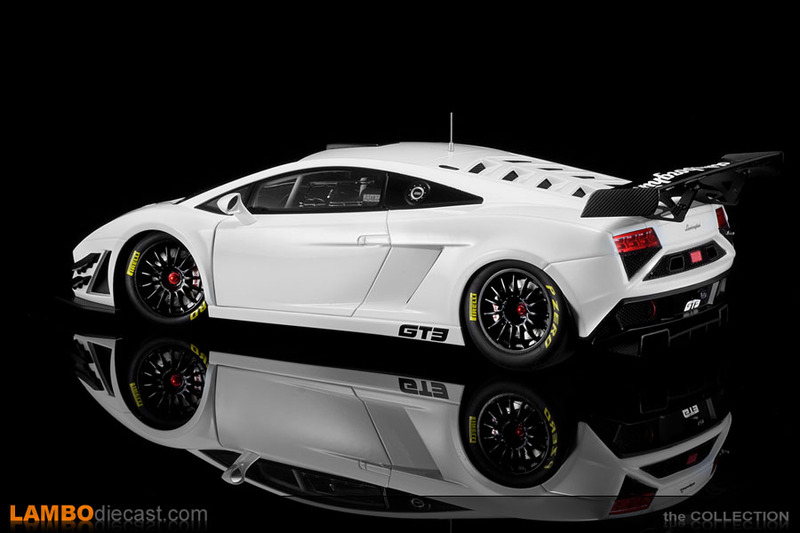 Both models offer steerable front wheels however, something Kyosho didn't bother to add on their sealed models, and in fact the fit and finish on the Minichamps Gallardo LP600+ GT3 is very, very nice ... but the AutoArt Gallardo GT3 FL2 is still a little better, more refined, more detailed. 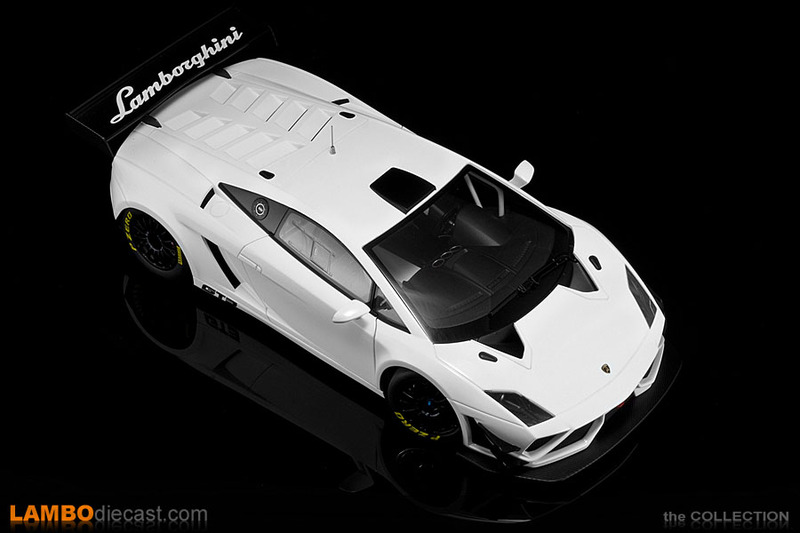 Should you get this new 1/18 AutoArt model of the Lamborghini Gallardo GT3 FL2? To be honest ... it depends on your personal collection. 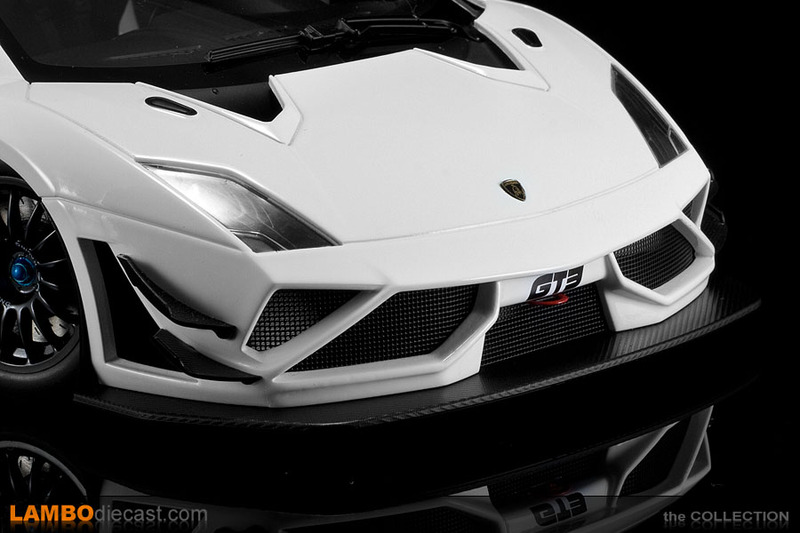 For me this model was a must have, that is why I paid €145 for it, I still think that is too expensive, even with all the details AutoArt got right ... 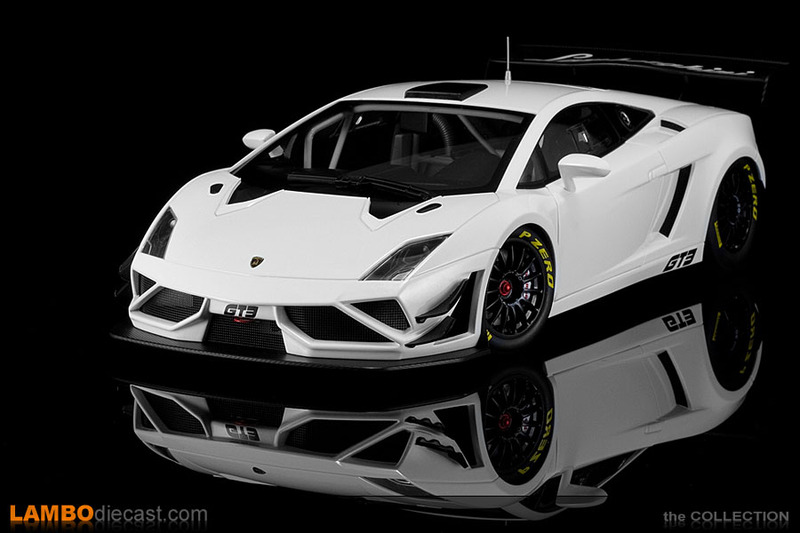 I would really like to have been able to open the front hood and the engine cover like they did on their Gallardo Super Trofeo model with the tiny magnets ... AutoArt already had most of the details to show here anyway. 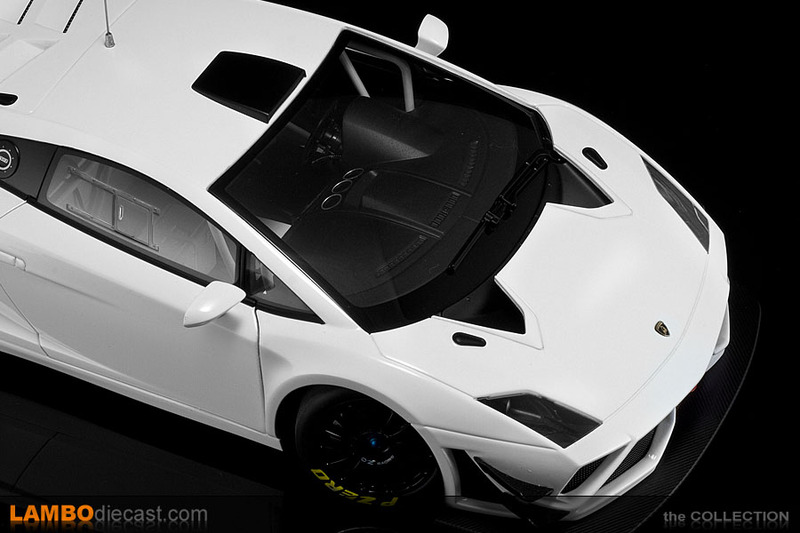 This model is very nicely finished, and it is almost a perfectly scaled down version of the real car made by Reiter Engineering GmbH ... in the end AutoArt is the only one offering this specific GT3 FL2 in 1/18 scale, so for me that was reason enough to add it to my collection ... which already counted a total of 49 Lamborghini Gallardo in this scale, of which 22 made by AutoArt ... so I didn't really need another Gallardo ... but this GT3 FL2 just had to be added.